Noctua’s custom-designed NE-FD1 is a next-generation PWM fan driver IC that integrates Smooth Commutation Drive (SCD) technology for quieter operation and allows for ultra-low power consumption. Its superb linearity and security features such as locked rotor or reverse voltage protection make it an ideal driver IC for premium-class PWM fans. 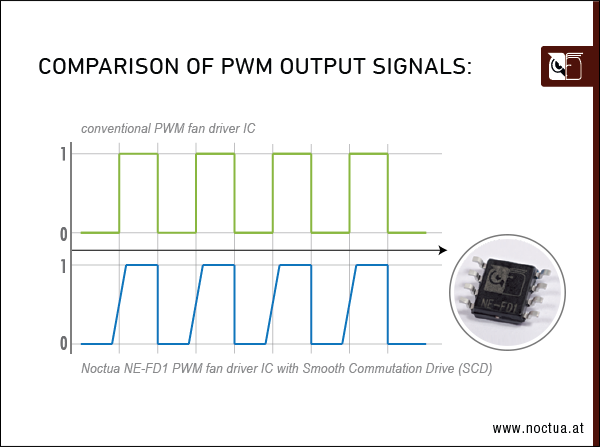 Most conventional PWM fan driver ICs put out square signals that cause sudden torque impulses. These impulses can cause minute deformations of the entire fan structure which lead to audible “clicking” noises that are especially noticeable with many common PWM fans running at slower speeds. Adopting Noctua’s Smooth Commutation Drive (SCD) technology, the custom designed NE-FD1 PWM IC slows down the slew rate of the output signal in order to give a smoother, less sudden torque impulse. This way, PWM switching noises can be effectively suppressed and the fan runs even quieter, especially at low speeds. Noctua’s NE-FD1 IC was not only fine-tuned for superior quietness, it has also been carefully optimised to allow for ultra-low power consumption. For example, the NE-FD1 based PWM version of the award-winning NF-R8, NF-B9 and NF-P12 fans consume 25-40% less power than their non-PWM counterparts. The NF-F12 120mm fan featuring the NE-FD1 IC draws only 0.6W, which is more than 50% less than many fans in the same speed range. This doesn’t only make it eco-friendly but also cuts down the electricity bill: Compared to a typical 2W fan, this allows you to save about half the price of the NF-F12 after 5 years of continuous use.